Years ago, as a college freshman in my introduction to psychology class, I made a comment to a professor about feeling nervous giving clients advice in counseling- after all, what if a client took my advice and it didn’t pan out? What if something awful happened because of my advice? My wise professor gently told my naive self that, actually, my job as a counselor would not be to giving advice. My job would be to provide compassion, empathy, perspective, skills, and space to help people improve their lives by changing their thoughts, beliefs, and actions. Fast forward to today, where I am a clinical counselor in private practice, and these ideas are no longer theoretical. They make up the work I love and am honored to do. Clients do ask me for advice from time to time. Actually, it’s not that uncommon. Folks often start counseling because they feel unsure and confused about their next steps. Maybe that’s you- you’ve been trying to handle anxiety on your own for years and have come to the conclusion that it’s just not going to improve without working through it with a professional. Good news is, there are so many excellent therapists, especially in the Twin Cities. Bad news is, if you’re looking for advice from a therapist, you’re not going to get it. Our conversations will help uncover your true values and desires. Once you have clarity on those, you’re able to confidently make your own decisions. My values and ideas for how to handle a situation may not align with yours- and that’s okay! You are the expert on YOU, and you get to make the decisions in your life. Learning to trust your instincts and honor your own perspective is part of the transformative work of counseling. Sometimes there is a different level of meaning behind the question- maybe when you’re asking me for advice on what to do in a relationship, you’re really asking if you are okay, if you are normal. Or perhaps when you ask me for advice on what to do with your career, you’re really telling me you don’t trust yourself to make decisions. These are more helpful and therapeutic conversations to have. We are used to seeking advice from the people in our lives- our parents, partners, friends, colleagues- and so it can make sense to do that in counseling. BUT- and this is something I tell all my clients in our first session- the counseling relationship is unique for a reason. Talking to a therapist is not the same as talking to a best friend or a physician or a hair stylist. A counselor’s job is not to give their opinion on what you should do or what the “right” way to handle a situation might be. So, what will I do instead? Local to the Twin Cities and ready to dive into counseling? Get started by scheduling your first appointment today. Winter in Minnesota seems to have appeared overnight. As I type, snow is falling and it’s a frigid 27 degrees here in Roseville, MN. I have nothing against the cold and snow (ahem, ask me again in March) but it seems like a bit much, a bit too early this year. But with this sudden shift in seasons, I’m now full-on thinking about the holidays. I’m very aware how this is not the most wonderful time of the year for many people, for a variety of reasons. One very common reason is depression. Depression zaps your energy, your mood, your motivation. How then, can we manage depression during the holidays? How can we take care of ourselves when everyone else seems to be decking the halls and fa-la-la-la-la-ing? How can you feel thankful on Thanksgiving, when everything actually feels terrible? How can you respond when a family member points out your apparent lack of Christmas cheer? How do you play with your little niece or nephew at the family gathering when you have almost zero energy? How can you interact with coworkers at the holiday party when you’d rather be in bed? How can you go about your daily life when the cheerfulness of the holiday season feels grating? Having a hard time getting into the holiday spirit? It could be more than just the shorter days and cold weather. Consider adding mental health counseling to your self-care toolkit this year. Get started today by scheduling your first appointment. Counseling appointments available in Roseville and New Brighton. I’ve noticed a few themes over the years of working as a therapist for young women. One of these themes is this pattern of women saying yes to things they hate. Things they aren’t actually interested in, or passionate about. Things that overcrowd their calendars. The yes comes over and over and it’s no surprise what happens next. Burnout. Exhaustion. Confusion. Resentment. Bitterness, even. Why do we say yes to things we hate? Why do we commit to events, volunteer gigs, or social events that we have ZERO interest in? WHY do we find ourselves on the verge of burnout with overcrowded calendars? A sense of obligation or duty. This is really about believing you don’t have a choice. This is a disempowering mindset that allows other people to make decisions about YOUR life. You do not need to agree to something just because someone you respect believes you should do it. This includes your boss, your parent, and your partner. You have more control than you think. A tendency to be a people-pleaser. As a people-pleaser, you put everyone else’s needs and desires in front of your own. You agree to statements, ideas, and behaviors that don’t actually reflect your values or desires. You say YES to events or activities out of fear- fear of upsetting someone else. You would rather say YES (and be unhappy) than risk your friend feeling angry or offended. A difficulty with boundaries. A boundary is simply a line in the sand, separating what is okay and what is not okay. Ultimately, you get to decide what you allow. Here’s how this shows up in real life: a friend of yours consistently texts you late at night, when you’re getting ready for bed. This disrupts your wind-down routine, but you always respond because you don’t want to leave her hanging. She’s learned to expect a prompt response from you regardless of the time. You end up feeling irritated and put-out by your friend, and she has no idea. This happens due to a lack of boundaries- as humans, we cannot be expected to meet expectations if we aren’t clear what those expectations are. The end of the year is a great opportunity to focus on what you are allowing into your life. Have you been saying yes to things that are no longer serving you? How has your mental health been impacted by saying yes to things you hate? That’s not a priority right now. I’m focusing on other things. Do you have trouble saying no? Do you keep saying yes to things you hate? Counseling can help you process why this happens and give you practical skills for learning to set boundaries and take charge of your life. Schedule an appointment to get started today. Counseling appointments available in New Brighton and Roseville. In my New Brighton counseling practice, I have the pleasure of working with high-achieving young adults. I specialize in anxiety and perfectionism, and many of my clients find themselves in demanding careers. Women who have perfectionistic tendencies often push themselves toward an unrealistic ideal. When the unrealistic goal is never achieved (because perfection is not achievable), they experience dissatisfaction and a lack of contentment. The cycle continues, and the woman is continually frustrated, believing her efforts aren’t good enough. Or worse, that she isn’t good enough. It's not difficult to see how this situation could exacerbate existing anxiety and depression. And, while I believe we’ve made progress in crushing the stigma attached to mental health, it can still be quite difficult to manage anxiety and depression while in a demanding career. Traditional work-life balance can be difficult, if it’s even possible at all! You may be expected to stay late at the office, or hop back online after dinner. Your job might require you to work weekends or nights, leaving you with little time to focus on yourself and your wellness. For better or for worse, demanding jobs require a significant amount of energy. I won’t tell you to change careers or refuse to meet your employer's expectations. But I will encourage you to advocate for yourself. If you don't put yourself and your wellness first in the workplace, nobody else will do it for you. Here's what I mean. If you need to go to your therapy session during the workday, have a conversation with your boss about that. Come prepared with ideas- maybe you can come in an hour earlier (or stay later) on those days. Increasingly, employers are understanding the real benefits of allowing employees to take good care of themselves. Happier employees = happier customers. How would your career benefit from an office culture that promoted whole-person wellness? We all get a boost when we feel our work is meaningful- just imagine how you might feel when advocating not only for yourself, but for the many others who would benefit from such a program. Take all your vacation days. Every single one! And encourage your co-workers to do the same. Just say “no” to the martyrdom that comes with hoarding PTO. Paid time off is part of your compensation package, just like your salary or health insurance. Your employer gives you these days as a respite from work, which is actually an investment in you as an employee. Studies show that employees who take their vacation days are more productive, more creative, and happier than those who don't. I have a hunch that these findings are especially true for those of us who are managing depression and/or anxiety on a daily basis. Feeling overwhelmed by the noise in an open plan office? Invest in noise-canceling headphones to focus in on your work as needed. Reserve a conference room for some quiet time. Take advantage of any flexibility your employer offers. Working remote one day per week can be a nice change from the daily commute. Can your hours be tweaked to start earlier or later in the day? Check into your employee assistance program. You may be able to see a mental health therapist free of charge through your company's EAP benefits. These programs are usually time-limited (e.g., short-term counseling), but if you click with the therapist, all the more reason to continue working with the counselor after your EAP sessions are used. Beware the office snacks! Pay attention to how food impacts your mood and anxiety. Take some time over the weekend to prepare lunches and snacks for the week. Focus on incorporating nutrient-dense foods into your work lunches- not only will this help you focus on your work tasks, but you'll avoid the emotional crash associated with too much sugar, processed foods, or caffeine. Similarly, beware of happy hour! A little nuance is important here. If anxiety or depression are telling you to isolate, maybe it would be beneficial to attend happy hour. If you have trouble saying no to alcohol or you end up relying on it to feel comfortable, maybe it's best to steer clear. Reflect on your needs and make the decision accordingly. Invest in yourself outside of work hours. Read personal development books, take fitness classes, explore your city, spend time in nature, reach out to old friends! I love sites like Career Contessa and The Everygirl for career inspiration. Find other interests outside of your career. What was it that your 8-year-old self loved to do? For me, it was reading and writing, especially while outside. What is it for you? Swimming, playing with a pet, doing something artistic? Resist the urge to isolate. Both depression and anxiety love to make you feel alone in your pain. There's a difference between spending time alone to rejuvenate, and spending time alone because depression is telling you to withdraw from your friends. Start meeting with a counselor. You could learn why you respond to a particular co-worker in that way, or why getting a “do you have a minute?” message from your boss sends you into an anxious tailspin. You could learn concrete strategies for thinking and behaving in a more helpful manner. Anxiety and depression don’t need to dictate your next career move. Counseling can help you learn to manage your mental health at work, while giving you practical skills to think and behave in more helpful ways. To get started, schedule your intake session today. Appointments available in New Brighton and Roseville. First things first- you have the power to decline the invitation. You do not need to attend every wedding you're invited to- especially if you're not particularly close with the couple. You're not obligated to attend another couple's wedding simply because they attended yours. One caveat: It's essential to understand your rationale for declining an invitation. If anxiety is operating in an unhelpful manner (i.e., anxiety is causing you to overestimate the level of discomfort you may feel), skipping the wedding is actually counter-productive. You see, the more we avoid a trigger, the larger it becomes. By exposing ourselves to our triggers and surviving, we regain power of the situation and our fear diminishes. Make a gratitude list before you go to the wedding. It's hard to perceive someone else's grass as greener when you're full of joy in your own life. This can still be true if you're going through a difficult situation. Let's say your own marriage is on the rocks and you're feeling envious of your friends' happy relationships. Before heading to the wedding, consider a few things that are going well. Maybe it's your career, your spiritual life, or a hobby. Focus your mind on those things and it'll be more difficult for the Comparison Monster to take over. Assume people have the best intentions. Instead of feeling irritated that someone keeps talking about their career success, assume they are only talking about it because it truly lights them up. Likewise, instead of getting offended when someone asks you if you'll start a family anytime soon, assume they don't have any knowledge of your situation and try a vague, gracious response. A quick "we'll see!" works just fine here. Focus your attention on the actual event. Notice the sights, the sounds, the tastes. Appreciate where you are and all the care that went into ensuring a beautiful wedding. Third, be realistic about the amount of energy you'll expend at the wedding. Anxiety tends to take up a lot of physical and mental energy, so take this into account. Make an effort to have some downtime before and after the event in order to best transition back into the workweek. Counseling can be a great way to build skills to manage your anxiety. If you're ready to take the next step, schedule your appointment today. Appointments available in New Brighton, MN and Roseville, MN. Ahh, weddings! I absolutely love them and always have. I remember being about 12 years old, planning what color bridesmaids dresses I would choose and what sorts of flowers I wanted to carry. Ironically, my actual bridesmaids chose their own dresses from a color pallet, and to keep things simple (and affordable) I opted for baby's breath in lieu of fancy flowers. Turns out, many things change from your middle school dreams to your real wedding. While I'm certainly no Katherine Heigel à la 27 Dresses, I spent a large chunk of my weekends throughout my 20s celebrating marriages. From bridal showers and bachelorette parties, to rehearsal dinners, ceremonies, and receptions, I've seen it and LOVE it all! Doesn't matter if we're in a church or a bar or a hotel or lakeside, I am here. for. it. Of course as a therapist and an INFJ, I'm always observing. One major theme I've noticed is the anxiety-provoking nature of wedding season. Whether you're the bride, a bridesmaid, or a guest, pressure can be high and feelings of anxiety can escalate. And so, over the next few weeks, we'll be talking about coping with wedding-related anxiety here on the blog. We'll talk about being the anxious bride, of course, as well as the anxious bridesmaid and the anxious wedding guest. Let's get started- how to cope with anxiety when YOU are the bride. Let's break it down between the wedding planning process and the wedding itself. 1. Delegation is your friend. I promise, the people in your life want to help. Ask them. 2. Remember the end goal. All of the hullabaloo is about a marriage- right? Keep that in mind. Focus on what matters. A beautiful marriage is infinitely more important than a beautiful wedding. Go on a date with your fiancé and DO NOT TALK ABOUT THE WEDDING. Seriously. Remember all those things you talked about and enjoyed pre-engagement? Go back to those. Give your mind a rest from all the plans and particulars of the wedding. Enjoy your relationship! 3. With all your important bridal to-do's, make time to care for yourself. Your personal needs are easy to gloss over while planning a wedding- but you need to tend to them. I'm not talking anything fancy here. Literally things like getting enough sleep, drinking enough water, exercising in some way, and eating at least semi-well. 4. The bridal shower is often a time of anxiety for brides- opening gifts in front of people can be anxiety-provoking. Many people feel uncomfortable with all the focus on them, especially when there is an expectation of a response after opening a gift. This is a very common experience. Remind yourself that you don't need to say anything beyond "thank you" when opening gifts, and that- and I say this as an attender of many bridal showers- people aren't paying that close of attention. We've already seen everything on your gift registry, to be honest with you! 5. Handling the financial part of your wedding can be anxiety-provoking. Oftentimes, the wedding planning process is the first time a couple is looking at their combined finances. This can make for some interesting surprises! If wedding finances are causing some anxiety, consider this your crash course for handling finances in marriage. Money fights and money problems are a leading cause of divorce, so it's in your best interest to learn how to communicate about finances now. I highly recommend investing in premarital counseling as part of your wedding budget- this will give you a structured way to discuss important topics like finances in a non-threatening manner. I often refer clients to Financial Peace University in addition to premarital counseling. 6. Focus on shifting your mindset. Your thoughts have a large impact on how you feel, so it's important to bring awareness to your mental life. Do you notice many thoughts starting with "what if...?" If yes- those are likely fueled by anxiety. Acknowledge your anxious thought, and try shifting it. The anxious thought keeps you stuck. The helpful thought fuels you toward action. Anxious thought: What if it rains during our outdoor ceremony? Helpful thought: I can't change the weather, but I can make a rainy-day contingency plan. 1. Eat! I'm not kidding- so many brides skip eating on their own wedding day, because they don't believe they have time, OR because they are so emotional they don't feel like eating. Not having enough food in your belly can mess with your blood sugar, causing you to feel anxious or otherwise not well. Make sure to eat before AND during your wedding! I know a couple who actually ate dinner in private during the reception- that way they were both able to eat their meals without interruption, while enjoying a sweet moment together before joining their guests for the dance. 2. Drink enough water. Ask a bridesmaid to be on "water duty"- her duties might just be bringing you a glass of water every so often. You'll be so busy dancing or chatty with guests that it might be difficult to get your own drinks. 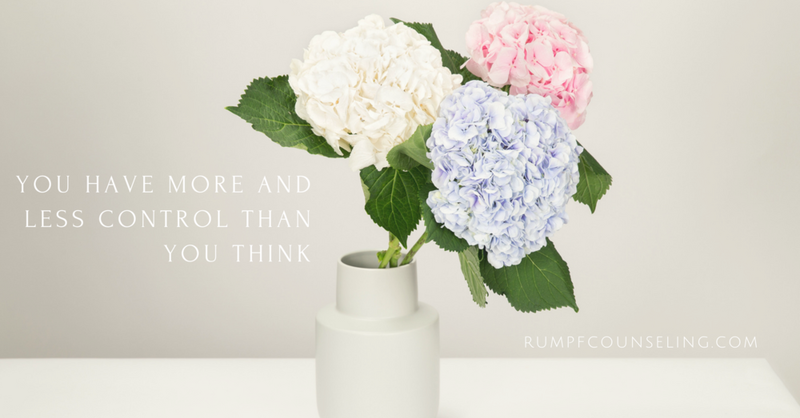 You may also want to watch your alcohol intake- sometimes alcohol can provoke your anxiety, so if you're noticing that happening ask the bartender to make you a yummy mocktail instead. 3. Step away for a moment. Take five minutes away from the hubbub to just breathe or try a grounding exercise- my favorite is 5-4-3-2-1. Here's how it works: Find 5 things you can see that make you feel calm. Once you have those, find 4 things you can touch that make you feel calm. Then find 3 things you can hear that make you feel calm. Next notice two scents that make you feel calm. Finally, take note of one taste that makes you feel good. Complete the exercise by taking a deep breath in and out. 4. Just like while you were planning the wedding, keep your eyes on the prize. If you find yourself feeling anxious about something happening at the reception, ask someone to take care of it and bring your attention back to the goal of the wedding, which was to get married. If that happened, is does not matter what else might be going wrong. 5. Practice gratitude. It's very difficult for anxiety and gratitude to coexist. Take a few minutes with your new spouse or a bridesmaid, and just make a list of everything you are thankful for- and don't take it too seriously. Heck yes, you are grateful for not having tripped on your dress while walking down the aisle! Make a list of 10 things and then notice how you feel. Carry this feeling on throughout the evening and see how it changes your perspective. Your engagement is a sweet time that will be over before you know it. It's not fair for anxiety to steal the show. If worries are taking over and you're not find enjoyment in the wedding planning process anymore, consider asking for support through counseling. You can decide to put yourself back in the driver's seat of this process and learn to soften anxiety's sharp edges. If you're local to Minneapolis - St. Paul, schedule an appointment to get started today. Control. We love it, don't we? We desire control over days, our work, our relationships, our emotions. We are uncomfortable with the unknown. It seems to be part of the human condition. When it comes to other people, we have less control than we think- and if we're being honest, less control than we would like. Now, most of us aren't out to control other people. But we certainly would like others to behave in ways that suit us and our needs. Our anxiety can get in the way of allowing others to experience freedom- freedom to make their own decisions, freedom to be who they are. We also have more control than we oftentimes believe. We have control over how we choose to handle situations. We can choose to respond, rather than react. We can choose to take a deep breath before responding to an irritating email. We can choose to smile at the person with a full cart ahead of us at the self-checkout. We can choose to think differently about any given situation. We often cannot change the situation- but we CAN change how we think about it. Situation: driving to work, lots of traffic, and I'm already running late. Thought #1: "WHY DIDN'T I LEAVE MY HOUSE EARLIER!? Why in the world is there so much traffic? This guy really needs to drive faster. Move it or lose it! I'll never make it to work on time." Thought #2: "Weird, there isn't usually this much traffic on this road. Wonder what's going on. Ah well... it's out of my control. I'm going to take a deep breath or two... oooh, now I have extra time to finish that podcast episode I was listening to this morning." Same situation. Different thoughts. Different results. Recognizing when you do or do not have control is absolutely key to your emotional wellness. When you realize you have control in a situation, you are empowered to make a choice, make a change. And when you understand you have no control over a situation, you may experience a release of that responsibility you were never meant to carry in the first place. Choose the most beneficial route- how can you act in alignment with your values? If you feel paralyzed here, that's a sign fear is getting in your way. Avoid making choices from a place of fear- address the fear first, then move forward with decision making. Download the Calm app and use the breathing meditation tool. Game-changer. Control issues are a common issue for many people. If you're ready to make some changes with how you handle control, consider working through this in counseling. Schedule an appointment to get started today. Why wait? One thing I've noticed about millennials (per Pew Research Center, those of us born between 1981-1996) is what appears to be a widespread prioritization of mental wellness. Clients often tell me they talk about their counseling sessions with friends and family. It was not too long ago that folks kept their counseling appointments completely secret, so this is a really cool progression. 1. Do you have the space in your life for therapy? Counseling is an investment that requires commitment. You will be spending time, money, and emotional energy to process and/or solve problems. Because it is a significant investment, I recommend assessing whether you have the space for it in your particular season. Do you have a space in your schedule for consistent sessions? Most of my clients schedule weekly or bi-weekly sessions. Consistency is key for continued progress. Do you have the finances available to pay for sessions? (and remember, finances don't need to be a barrier to mental health services)? Do you have the emotional bandwidth to process your session content throughout the week? This part is really key. I've seen the best progress when clients have take the time to reflect, mentally organize, and practice new skills in between our counseling sessions. It's one thing to discuss change for 50 minutes each week, and quite another to put things into action each day. 2. Are you ready to be vulnerable and work hard? I get it. Vulnerability is HARD. Part of vulnerability is trust- which is why your connection with your therapist is so important. You might not jibe with the first (or second) counselor you see. There is no one-size-fits-all therapist. If you're not vibing with your current counselor, I encourage you to assess your needs and find someone who might be a better fit. Therapy is a lot like other things in life, in that you'll get out of it what you put in. You'll need to put in effort to get results. Working hard means you'll come prepared with a general idea of what you want out of therapy. I recommend coming into session with some thoughts of what you'd like to focus on that day. We'll have a treatment plan to guide us, but the best results will come if you are focused on what you want to process in session. 3. Are you willing to accept the discomfort of change in order move forward? You're considering therapy because something doesn't feel right. You want relief, healing, or increased insight. You've got two choices. If nothing changes, you're stuck with the discomfort of what you're going through now. If you change, you must deal with the discomfort that comes with a new way of being, feeling, acting, or thinking. Both of these options require discomfort. It is up to you to decide what is more painful- staying the same, or changing. Please hear me- there will be times that you honestly do not have the emotional bandwidth to handle change. Give yourself some grace here. You will know when the pain of staying the same is stronger than the pain of changing. If your answers are a resounding "YES" then it's time to get started! Take the first step by scheduling an appointment. Over the years, I've noticed many FALSE, yet commonly held beliefs about counseling. Whether it's from a poor portrayal in a movie, or just someone without all the facts on mental healthcare, there's a lot of misinformation out there. I am eager to dispel some of it. Let's go! My therapist will fix all my problems. Unfortunately, I don't have a magic wand. I do not have any special powers to make your problems go away. Counseling is a process, and it's one that takes a significant investment of your time, energy, and finances. We will work together to figure out what goals you'd like to achieve, and then focus on those collaboratively throughout the course of therapy. If you're feeling stuck and unsure where to go, I want you to know that you are not alone. You don't need to figure this out yourself. It is my honor to work alongside women just like you who want to experience greater freedom. Counseling is expensive and out of reach. Sometimes finances can be a barrier to seeking quality mental health counseling. Therefore, I do my best to make counseling services more accessible. In-network health insurance: I am in-network with some insurance companies. Depending on your plan, you may have the full cost covered, or just be responsible for a smaller portion. If you do have a deductible to meet before insurance pays for counseling, you receive a discount from my full fee, just by seeing a counselor who is in-network. Out-of-network insurance reimbursement: If I am not an in-network provider for your insurance company, we can work around that. You may be entitled to partial reimbursement from your health insurance. I will give you a receipt that you can upload to an app- the good people at Better will take care of everything and send you a check for you are owed. Couldn't be easier. Open Path Psychotherapy Collective: I am pleased to partner with Open Path to offer discounted rates for clients who cannot afford the full fee or do not have health insurance. I reserve 4 slots for Open Path clients- please contact me to inquire on on current availability. Groups: Group therapy is a great way to receive low cost counseling services. I offer groups for teens and adults, at $30 per session. If you are interested in group counseling, check out my current offerings here. Creative thinking: Outside-the-box thinking can be huge here. Do you have family or friends who are able and eager to invest in your personal development? How about your church? Sometimes churches have what are called "benevolence funds" to help pay for counseling. Do you have a dining out habit that could be pared back (temporarily) in order to make room in your budget for counseling? Free community resources: For completely free counseling services, check out the Walk-In Clinic. With locations in Minneapolis and St. Paul, they are able to serve individuals who are unable to pay for sessions. This is a great resource in the Twin Cities! -the 23-year-old woman who is excelling in her career already- but also fears she has lost who she really is. -the newlywed who can't understand why she feels lonely and depressed when she thought marriage would bring happiness. -the college student who feels completely overwhelmed trying to balance intense coursework and a social life. -the professional who feels like she just can't get it together and wonders if she'll ever feel control over her anxiety. -anyone who wants to experience freedom and a deeper sense of peace. She wants to be in a better place emotionally before marriage. She wants to unpack and process situations and relationships from her past. She wants to learn practical skills to manage anxiety. She wants to gain confidence in her identity. She wants to stop thinking so negatively about herself. She wants to find ways to communicate better with a toxic boss. Counseling is uncomfortable. Okay, this one is actually a half-truth. The common belief is that counseling will either be awkward or emotionally excruciating, scaring people off from making an appointment. I get that. And, the reality is that you won't always feel comfortable in therapy sessions. You may be challenged to view yourself or a situation differently. You may be asked to try some new behaviors. But, catch this- this is important: you are never alone in this. My job as a counselor is to create space for you to process, grow, and heal. We will do this together. If you're local to Minneapolis - St. Paul and are ready to start counseling, I'm so excited for you! Take the first step toward healing and freedom by scheduling your first appointment today. As a counselor, I have the privilege of working with many high-achieving young women. These women are dedicated to careers and families and have high standards for themselves- and often are just BUSY. It can be difficult to carve out time to take care of themselves. And so, oftentimes, part of our work includes creating and maintaining a solid self-care plan. I tell each person that her plan will be unique, tailored specifically to her own needs. After doing this for several years now, I thought I would share my actual plan! I do NOT do these things all the time. This is my Plan A- it's my best case scenario, not what ALWAYS happens. Having a plan helps me redirect when I'm feeling stressed or unsure what to do. These are just things that work for me. You may or may not feel calmed or rejuvenated by these practices. This is just an example to get you started. Scent: Diffusing essential oils- my favorite is Peace & Calming from Young Living. Sight: Repeat after me- outer order contributes to inner calm! I knew this intuitively, but when Gretchen Rubin put words to it, it made for an easy mantra. If I'm feeling stressed, it's helpful to clean off my workspace or kitchen counters. Sound: Listening to sad music actually has a positive impact on my mood- and the research backs this up! Throwing on an Dashboard Confessional album gives me a mood boost. Also, do not underestimate the power of the playlist! Having playlists for different activities helps me to enjoy life more fully. For example, listening to my Frank Sinatra playlist while making dinner instantly turns an everyday task into a event. Touch: Having ultra soft blankets around the house and choosing non-itchy fabrics in my clothing is key. Taste: A cup of my tea in the evening (especially during our 5-month winter in Minnesota, ahem) has a calming effect. I'm sensitive to caffeine, so for me, this has to be herbal tea. Work: My clients notice I'm not in the office in the mornings or all day Friday. This is intentional. Providing quality counseling is a priority to me, and I know that can't happen if I'm rushed or overtired. This structure doesn't work for everyone, and it may not work for me later on- but that's the beauty of creating your own plan- you have the power to change things at any time. Personal: I am fiercely protective of my time. This is not a selfish move, but rather an intentional choice so that I may show up fully to the things that matter most. If I'm saying "yes" to things that don't align with my values/are a waste of my time and energy, I have less to give to the activities and people that are at the top of my priority list. Soul: I'm a person of deep faith, which means soul care is incredibly important. I take time daily to pray and read scripture, as well as engage in my faith community. Body: I make exercise work for me. I used to go to a gym and it didn't work well for me. I now do my workouts through an app, where I can schedule classes at a time that works for me, from the comfort of my living room. Relationships: I've got a lot of long-distance friendships. No two ways around it, this can be difficult. But it also makes for really fun reunions and travel opportunities. One of the top 5 things people regret at the end of their lives is that they didn't stay close to their friends. This is not something I want to regret when I die, so I make the effort now. Sometimes this looks like having a virtual happy hour over FaceTime, and sometimes it looks like driving 6 hours to Chicago for a long weekend with good friends. There you have it! And just to drive the point home- life happens. Sometimes- a lot of the time- these things don't work out or I get distracted, or something else becomes a priority. That's okay. The idea behind having a self-care plan is so that you have go-to ideas to help yourself feel more calm, grounded, and purposeful. Ready to make your own self-care plan? You don't have to go on feeling anxious and overwhelmed. Take good care of your mind and soul through counseling. Get started today by scheduling your first appointment. A couple weeks ago, I woke up to yet another gray, dreary day. In a funk, I poured myself some coffee and stared out the window. It isn't fair, I thought. This isn't how it was supposed to be. My sweet husband sat next to me and asked what was wrong. I silently stared out the window, hoping he would just read my mind. So, what was happening here? Why was I in a terrible mood? Minnesota winters are notoriously cold, dark, and long. Average highs in January and February are somewhere around 25 degrees. The sun rises late and sets early. Here in the Bold North (did we all agree on this branding, post-Minneapolis Super Bowl?) we are intimately familiar with winter. We take pride in our hardiness, our ability to deal with snow and frigid temperatures. But there comes a time when a girl just needs a little break from winter. And so, when my generous in-laws invited us to join them at at Florida beach rental, I started dreaming about sunshine, sandy beaches, and umbrella drinks. About a week before our trip, I decided to look at the Panama City Beach forecast. I wanted to know just exactly how many pairs of shorts I would need! Ahem. Reality hit me like a ton of bricks when I saw that Panama City Beach was forecasted to have a full week of rain. I wish I could say I took this in stride, but to be honest, I was really disappointed. To make matters worse, the forecast kept changing. My emotions did too. When sun was forecasted, I felt excited and relieved. When the rain was back, I felt resentful and frustrated. Yes, this is where I seem to have forgotten that I'm a therapist and have all sorts of skills to deal with unpleasant thoughts and emotions. We arrived in Panama City Beach on Saturday evening. The fog was so dense, my mother-in-law was concerned our plane wouldn't be able to land. No kidding, when we arrived at their beach condo, we couldn't even see the see the sand or water. Sunday came and brought with it torrential downpour. We got caught in the rain and ended up a bit soggy. On Monday, it was still dreary and cool. Two days of being cooped up inside, and let's just say I wasn't my best self. In cognitive behavioral therapy, we pay attention to how thoughts and behaviors impact emotions. This means our emotions do not just appear in response to a situation. Rather, emotions are the result of how we think and how we act. The weather itself was not causing my foul mood. My thoughts and expectations about what I thought the weather should be like were actually the cause of my mood. My crossed arms and frown certainly weren't helping, either. Unhelpful, actual thought: I cannot believe it's gross AGAIN this morning. This is my beach vacation, how could it possibly be so dreary? Helpful thought: Shoot, I was really hoping it would be sunny today. Well- I can't change the weather. I'm so grateful to be here and to spend time with family. Wouldn't you know it, the sun actually did come out that afternoon, and the rest of our vacation was filled with warmth and sunshine. We all have difficulties with unhelpful thoughts and behaviors. It's part of the human experience. But anxiety and overthinking do not have to rule your life. You deserve to have peace in your mind and in your spirit. If you notice that anxiety is starting to take over more of your headspace than you'd like it to, consider counseling. We can walk through this together, you're not alone. Self-care does NOT mean treat yo'self! A video about millennial self-care circulated the internet about a year ago. It was a good-natured jab at the millennial generation's supposed "obsession" with self-care, and how our generation tends to think about self-care in terms of buying fabulous things and living a life of luxury. Example: I'm going to buy these new Louboutin pumps because, self-care! Wanting and having nice things isn't the issue. It doesn't even have to be about high-end products or experiences. If you get your nails done weekly or get coffee a couple times each week and consider that self-care, that's great. But when it stops there, it becomes a lesser version of what self-care can really be. There is so much more to the concept of taking good care of yourself. I believe we do ourselves a great disservice when we consider the "treat yo'self" mentality as the end-all-be-all of self-care. Ask for what you need at work- is it more autonomy, more responsibility more pay, more vacation? Anxious thinking (you know the type- overthinking, "what if...", lots of shoulds) make it hard to think clearly enough to create a solid self-care plan. I know how feels to have your mind buzzing like a bee, unable to concentrate- even when what you're trying to focus on is taking care of yourself! I work with women every day who have decided to take steps toward a more calm, peaceful life. If you want in, schedule your first appointment. We can work together to create the life you want. This is no longer news but it's so important that I'll repeat myself: Your mind and body are strongly connected. Your emotions are impacted by your physical body, and vice versa. Same goes for your thoughts and emotions. This connection is why we need to pay attention to how our bodies feel during any given emotion. As a therapist, I sometimes ask clients to figure out where they are feeling their emotions- for example, people often say they feel sadness in their chests. When I'm anxious, my body is the first to tell me- my shoulders creep up toward my ears, my hands form into fists, and my breathing is shallow. This mind-body connection is why I love yoga. Taking time to calm the mind and body simultaneously is enormously helpful. To be clear, I'm not a yoga instructor and have had zero formal education on it- but since I regularly recommend yoga as a supplement to therapy, I thought I'd share a few sequences here. Are you ready to take the next step with the mind-body connection? Counseling is a powerful vehicle for healing and growth, and I often incorporate mindfulness and body awareness in session. Find out more about the mind-body connection by setting up your first counseling session today. After years of studying and hard work, you did it. You graduated, earned your degree, and landed a job you love. Everything is wonderful. Sound about right? Reality is, you're tired. You work all the time and you miss your girlfriends. Your group chat is blowing up your phone all day but you barely have a moment to read the messages, much less respond. You miss the days when you could bop over to a friend's place at a moment's notice- the days when your personal life didn't take such a back seat. You get to work early, stay late, eat dinner in a rush, and hop into bed so you can be rested when it all starts again tomorrow. As you drift off, you find yourself wondering, "Is this really it? Is this what I want to be doing?" You're grateful for your job and have big career aspirations, but you can't help but think you're missing something. There has to be another way to live... right? YES! 100x yes. You can choose a different way of living. Even if your core circumstances can't change right now (you are genuinely happy with your career and want to focus on that right now), there are tangible, specific ways to improve your life. Give these tips a try to feel less anxious, more calm, and at peace in your daily life. Use all your vacation days. Seriously, do not leave vacation days on the table. Before I worked as a counselor, I worked in the finance department of an advertising agency- which is, in itself, a story for another time! Anyway, a lot of people at the agency seemed proud when they didn't take time off. They appeared to flaunt the fact that they were in the office week after week, without a break. I always thought that was such a bummer- for the person and for the agency. And it wasn't just my agency that had this issue- in 2016, 54% of workers had unused vacation days at the end of the year. Taking all your vacation days is actually beneficial to both you AND your boss/company. When you are well rested, you will bring more creativity and energy to your work. Sounds like a win-win to me. Eat lunch somewhere besides your desk. Even if you can't take a leisurely lunch, do something to make this break in your day completely separate from work. Eat in the break room, walk to get take out, bring your lunch to a nearby park or bench, or if you're in Minneapolis - St. Paul, meet a friend at a food truck- as a sidenote, there are SO MANY delicious food trucks in the Twin Cities! I recommend Dough Dough and Misfit for a treat. Regardless of where you eat lunch, make sure to give your body a chance to stretch. Give your mind some time to shift away from work tasks. You will feel rejuvenated and will return to your project with a fresh set of eyes. Schedule in time for self-care... don't cancel on yourself! Once you believe self-care is essential to your overall wellness, it will be difficult to cancel on yourself. This is an intentional mental shift. Treat your self-care plans with the same amount of seriousness as a meeting with your boss. Practically, this means you will follow through with your plans even if something pressing comes up that day. For example- you have a wine and cheese night with friends scheduled for Friday evening. Friday afternoon, your boss gives you a project due next week- you're tempted to change your plans in order to get this project done- but since you value taking care of yourself, you keep your original plans and have a relaxing night with friends. Or, if you're planning a solo night in with a book and a bubble bath, remember that you've set this date with yourself, and you can definitely turn down that dinner invitation. Knowing yourself is key here- what one person considers self-care can be quite the opposite for someone else. For instance if you are an extrovert, you actually recharge by being around people- which means you need to be social to be energized. Introverts gain energy by being alone, and so choosing a night in would be a great way to take of yourself. Find a bedtime routine that transitions you into a restful slumber. I know lots of professionals who hop right back on their laptops at night, and then work until bedtime. I suggest finding a different way to spend your evening. Engaging your brain in work projects so close to bedtime is not helpful for quality sleep. Yes, some evenings you probably will have to (or maybe even want to!) do some work after hours. On those nights, make it a priority to shut down your laptop an hour before going to bed. Then do something to transition into relaxation- my favorite options are yoga, reading something fun, or taking a bath with epsom salts and essential oils. Give yourself a break. It's time to stop being so hard on yourself. I've noticed that most people really are doing the best they can. You cannot do it all, and to expect yourself to do otherwise is setting yourself up for disappointment. Practice self-compassion, and treat yourself the way you would treat someone you love. Does this resonate? Have you noticed your pace at work getting in the way of how you want to live your life? Let's talk. As a therapist, I love working with young professionals to find more balance, more peace, and a better life. Schedule your first appointment to get started. The year was 2013. I was finishing up grad school and like many students, was feeling overwhelmed. I was balancing a lot- working on my thesis, counseling students at a local university, taking classes at night, and adjusting to my new life as a newlywed. All good things, all things I was happy to be doing. I could tell by the tension in shoulders and my increased cravings for Ben & Jerry's that it was getting to be too much. All the newness and change had started to take a toll. There needed to be some unmoving, unchanging routine in order to manage all the newness and change. I began to look for something to help me feel more calm, less anxious, and able to focus on the present. As a counselor-in-training, I was constantly talking with my clients about the importance of self-care and daily routines to cultivate calm. I went out to my favorite stationary store, bought a pretty notebook, and got started the next morning. Now, allow me to interrupt this story to say- a gratitude journal can be highly personalized to whatever you need it to be. There are many ways to do this, and you can truly make it your own. For me, it was best to keep it short and sweet. I made a rule for myself that I didn't have to get fancy or flowery in my language, and that it didn't need to become a full-on, legitimate journal. Instead, I wrote the date and then listed three things I was grateful for. On tougher days, my entries looked more like this: "I'm grateful for this coffee. I'm grateful that Parenthood is on tonight. I'm grateful for this couch." Yep. Remember how I said I wasn't going to get fancy about it? It didn't take long for me to start looking forward to this morning routine- I actually looked forward to waking up, making coffee, and settling in with my gratitude journal. My short, begrudging sentences became more enthusiastic and genuine. Over time, I noticed myself feeling grateful for small things- someone letting me onto the freeway during rush hour, the different shades of green on the trees outside my window. My focus shifted from the stressors in my life to the beauty that was all around me. What you focus on, increases. When you shift your focus from what you are lacking to what is already there, you will feel different. Gratitude widens your perspective and opens up your life- it makes what you already have enough. It changes everything. Research backs this up- studies show the amazing benefits. Practicing gratitude has been shown to have results like increased optimism and happiness, plus improved sleep, self-esteem, relationships, and depressive symptoms. And negative side effects? I'm not sure there are any. Give it a try this week- make a point to write down three things you are grateful for each day. Notice what changes in your mind, body, and spirit. Anxious thoughts and feelings can make it hard to cultivate gratitude. The good news is, it doesn't have to stay this way. Counseling can help. To get started, schedule your first appointment today. I've been thinking recently about the process of counseling- specifically, what it takes for someone to take the first step and get started. Scheduling an intake session and then meeting with a therapist for the first time takes courage- it's not unusual to have some nerves around these things. I decided to come up with a list of a few things that, I think, could help ease some of the first session nerves. My hope is that at least one of these will resonate with you and help you to feel more comfortable about coming into therapy for the first time. Without any further ado, here are my top 13 things to know before starting counseling. I've heard a lot of things in my time as a counselor. Before starting in private practice, I worked as a mental health case manager for young adults with severe and persistent mental illness (SPMI). Before that, I interned at a local university's counseling services office and worked with undergraduate students. Currently I maintain a caseload of primarily young adults with anxiety and depression. Even though I've heard a lot in my time as a counselor, I want you to know that your story is unique. I don't know what it's like for you to have a panic attack. Yes, I know a lot about anxiety and depression, but I don't know how it impacts you and your life specifically. I'm a big believer in the individuality of all humans- and so our work together will be tailored specifically to your needs and preferences. Although I'm a big advocate for incorporating yoga, deep breathing, and mindfulness into our work, if that doesn't jibe with you, we won't do it. Counseling is not a one-size-fits-all situation. I think you are unique, just like the rest of us :-) One of the greatest parts of counseling is getting to know you on a true, deep level. There is no need for pretense. It's an honor to hear all the unique parts of you and your life. Many of these things are private and not shared with others outside the counseling room- and so it makes sense that you could think you are alone in your idiosyncrasies. In fact, the more time I spend as a counselor, the more I realize how alike we all are, and how much we keep to ourselves. I'm not saying we should all go out and talk openly to anyone about the things we discuss in therapy. Rather, I'm advocating for us to accept ourselves just as we are- knowing there is nothing weird or strange about these things, but just that there is something unique and lovely instead. Counseling is an exercise in vulnerability. You come into a new office, fill out a bunch of paperwork, talk about your history, your family, your life, your struggles. All of this is shared with someone you don't yet know well. And once we start meeting regularly, you'll be sharing more about your experiences, emotions, relationships, thoughts... and that is amazing. Often new clients will say things like, "you must think I'm crazy" or "this is so weird of me, but ____"- the truth is no, I don't think you're crazy, and no, you're not weird! So many people go through life without addressing problematic relationships, mindsets, habits- the fact that you come in and want to work on these things says a LOT about you. Every session will not be mind-blowing. In the same way, every session will not be light and easy. In general terms, there is an ebb and flow to the counseling process. One session you may be processing a difficult situation, and the next week you may not want to discuss it at all. That's okay. Sometimes you might walk out of my office and feel a sense of relief, peace, or direction. Other times you might leave feeling anxious or tired. That's okay too. The important thing is to keep coming back and lean into the work. After particularly emotional sessions, I might suggest spending some time with intentional self-care afterward. It's important to tend to all parts of your whole self- and so, if you've just spent 50 minutes in my office talking about your thoughts and emotions, I may suggest that you go for a walk or sign up for a yoga class that evening. This is especially helpful for the women I tend to work with- women who have a natural bent toward overthinking and feeling things deeply. Sometimes you won't know what to say. Sometimes I'll hold off on responding for one reason or another. It's okay for there to be silence. Oftentimes we are made to believe that silence is awkward or uncomfortable- undesirable. But I believe there is deep value in silence. Your brain thrives on silence. With all the noise in the world, sometimes you just need a minute (or two) to sit in the quiet. Oftentimes my response will be silence- sometimes it's an invitation for you to continue processing (internally or externally) and sometimes it's a response to a direct question you've asked me. Don't feel like you need to fill the silence. If it feels uncomfortable, we can talk about what might be going on to make it feel that way. My office is a place for you to just be- you do not need to please, perfect, or perform. People tend to be surprised at this. I've had friends ask if being a counselor is emotionally draining and even depressing. But you would be surprised at how much laughter happens in the counseling room. First of all, humor is a common defense mechanism and so it's often present. Second, looking at your life and situation through the lens of humor can be a great way to cope with heavy emotions. Third, I intentionally use humor to help new clients feel comfortable, and to set the tone. I'm a pretty laid back counselor (and human in general), and so being uptight and serious is not really authentic to me. And because the counselor-client relationship is so important, we both need to be our true selves in session. Most clients I work with come in for sessions weekly, or every other week. In the scheme of your month, that's between 2-5 hours of your time. I believe strongly in the power of counseling (good thing, or else I'd be out a job!) but also know that a lot can happen in between sessions. Research shows that what happens outside of counseling has a huge impact on the success of treatment. And so, I regularly assign homework to my clients. It is tailored to you and your needs, and is never a gigantic time commitment. A couple examples might be: watching a TED talk to discuss in our next session, reading a relevant article, practicing your deep breathing, exercising 3x/week, tracking your mood with an app, or making an appointment with your primary care doctor for a holistic approach. Counseling is not a one-and-done treatment. Oftentimes people experience a dip in their mood after starting counseling- this is because we're starting to address some of the more difficult things in your life and that can be emotionally and relationally disrupting. It's super important to have consistency in counseling appointments. We can decide together how often is appropriate for you to be coming in. Dropping in once every couple months is usually not a great way to see lasting change in your life- and coming in too often when things are going well for you also isn't helpful. I have a master's degree in counseling psychology and a bachelor's degree in psychology, and have been working in private practice for a few years. However. None of this gives me insight into how YOU are experiencing things like anxiety, perfectionism, self-doubt, or depression. You are the expert in your own life. I am not here to give advice. I am here to support you, listen, provide feedback, give perspective and new insights, provide new ways of thinking and behaving, and teach you coping skills too. All of these things work in conjunction with your inner wisdom about what's going on for you internally and relationally. Length of time spent in therapy varies so much. Each person comes into counseling with a unique perspective, history, and experience. You might come in for a specific reason, and end up processing something different as time goes on- which is totally okay! You may also be in counseling for a season, and then come back a few months or years later. This is another reason it's so important to have a good relationship with your counselor- you want to feel really great about going back to see your counselor, and know that this person will be able to support you in whatever season you are in. Exceptions apply, of course, if you happen to be seeking counseling for a specific issue that your counselor is not equipped to address- for instance, while I do premarital counseling, I don't work with couples who are already married and are experiencing issues. That's one area where I would give you a few great referrals for a qualified marriage counselor. I do a lot of work around perfectionism, and so this is often something that is addressed. People can find themselves getting frustrated with their perceived lack of progress after a couple sessions. The truth is, it's going to take more than a couple sessions to really make some headway. The first few sessions often include psychoeducation on anxiety or whatever concerns you're bringing into counseling- and we'll also work on coping skills to help you find some relief. But the deeper work will take longer, and it will take a certain amount of effort. If you walk out of a counseling session feeling like everything's not fixed, it could be a sign you're right on track. These are your sessions, and you are in charge of where we go in them. As an outside observer, I'll oftentimes be able to see situations in a new light or provide new insights on what's going on. I can also gently suggest spending time focusing on specific issues that I'm noticing in session- but you always have the ability to decline or choose to delay those conversations. It's helpful to come into session with an idea of what you'd like to focus on that day, but it's not necessary. I review my notes before sessions so that I'm better able to focus on what needs to be addressed. Whereas a regular counseling session doesn't follow a set structure, the first session, called the intake session, will do that. Different therapists handle the intake in their own way, but here's how it will go if you come to my office: You'll sit in the waiting room until your appointment time, where you are welcome to make yourself some coffee/tea/cocoa or grab a water bottle. I'll come to get you and we'll head back to my office. There will be some initial paperwork for you to fill out, and we'll go over the informed consent- this is a document that lays out all the nuts and bolts of entering into a therapeutic relationship. Next we'll dive into an interview- it's less formal than it sounds, I promise! Essentially I'll be asking you a variety of questions about you, your history, your family and friends, community supports (church, work, communities, etc.) and what you hope to work on in counseling. The last thing on the agenda is to create your treatment plan- your goals. Oftentimes this happens in the second session if we run out of time during the intake. We close the first session by addressing payment and insurance questions, and scheduling your next session. I help women in their 20s gain freedom from anxiety, self-doubt, and perfectionism. Schedule your first appointment to get started today. Ah, summer. Maybe it's the longer days, or maybe it's just leftover from childhood, but I tend to do the bulk of my reading during these months. At least, that's my intention! As a counselor, I work with ambitious women who have perfectionistic tendencies. Perfectionists often have an all-or-nothing mindset, and so, when it comes to reading, many end up not reading at all. Perfectionists often have a stack of books on their nightstands, with every intention of reading them, but have trouble making it happen. It makes sense. After all, perfectionism is draining, often in more than one way. When your energy is zapped by striving and overthinking, it's hard to decide what, when, and where to read. Present Over Perfect: Leaving behind frantic for a simpler, more soulful way of living. Shauna Niequist takes you on a journey from a hurried, fast-paced life to a lifestyle of grace, compassion, and slowness. This is a great pick for anyone who is ready to ditch the heavy load of perfectionism and lean into grace instead. It's one of my favorite reads from the past year. The author has her own podcast, which I also highly recommend! The Gifts of Imperfection: Let go of who you think you're supposed to be and embrace who you are. This book has laid the foundation for my own personal development, and I use it often in counseling. It's one of my all-time favorites. Brené Brown is an academic who writes in an accessible way- it's not hard to imagine her sitting across the kitchen table from you while reading this. Check this out if you like a blend of story and practical application. For a perfectionist's reading list, it's hard to beat topics like vulnerability and worthiness. At Home in the World: Reflections on belonging while wandering the globe. Oh my. This one really did nothing to calm my wanderlust. Tsh Oxenreider chronicles her family's 9-month trip around the globe- with three children. The reason this is a great read for perfectionists is twofold. First, it deals with the dualism of deeply loving travel and deeply loving life at home. Often it feels like we need to choose one or the other- either be an adventurous traveler or be a steady homebody. This way of thinking is especially pronounced with a perfectionistic mindset. Second, this memoir sheds light on embracing the messy, unpredictable life of travel. Especially in a world where we splash our travels all over social media, it's refreshing to see the other, less glamorous side. Love Lives Here: Finding what you need in a world telling you what you want. Never have I read a book and felt such an attachment to the author. This book includes stories from Maria Goff's life and family, and emphasizes love and grace above all. When the world is telling you to strive for perfection, Maria is here to point you toward warmth and compassion. She also drops difficult truths enveloped in empathy and humility. She is an inspiration for how to live a life full of grace, and prioritize family relationships in the hustle and bustle of the daily grind. Scary Close: Dropping the act and finding true intimacy. Donald Miller writes about his decision to stop pretending and instead show the world the truest version of himself. Scary Close is all about being authentic with yourself and the people around you. It's about how scary vulnerability is- and how you can end up down a dead end road without it. Perfectionism tells you to put up walls, show the world the pretty, Instagram-friendly version of yourself. Vulnerability tells you to show up and be seen. That's where the good stuff happens. And bonus- this book comes with a free soundtrack. Why don't all books have soundtracks?! What a lovely concept. I hope you enjoy and are challenged by these books. Maybe you're in a place where you'd like extra support and guidance. A place to work out some of the concepts you're learning in these books. Counseling can be that place. Schedule your first appointment to get started today.